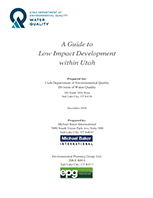 View the latest Low Impact Development Manual (9 MB). As a community grows, vegetation is removed and the surface area is covered by parking lots, roads, and rooftops. Precipitation cannot soak through these hard (impervious) surfaces. Traditional storm water conveyance systems carry precipitation offsite through a conventional “collect-and-convey” system of pipes, ditches, and storm drains. The volume of storm water (runoff) that is discharged to and transported by municipal storm-drain systems is one of the main causes of water quality issues in most urban areas. 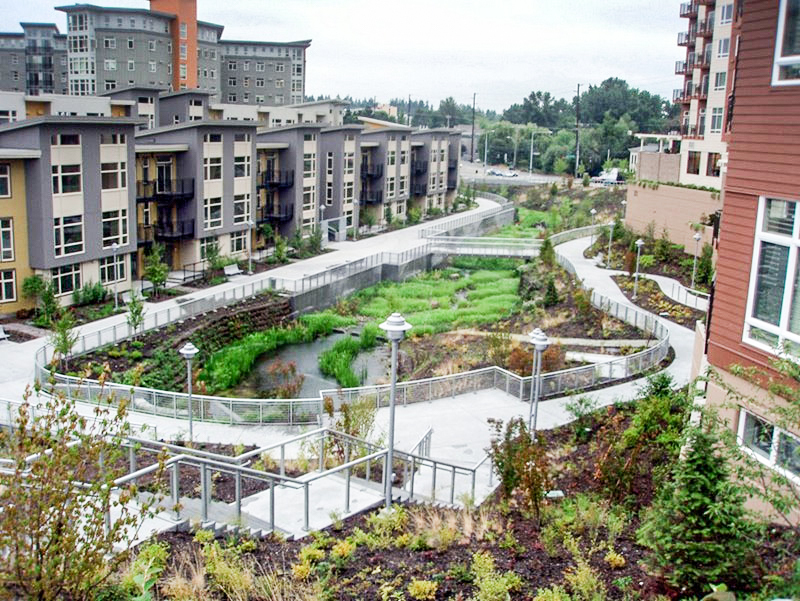 Low Impact Development (LID) principles utilize storm water as a resource to retain precipitation onsite. LID principles mimic nature by using techniques that infiltrate, evapotranspire, and/or harvest/reuse the runoff generated. Bioretention systems help improve water quality by filtering heavy metals, nutrients, and suspended solids and oil and grease. 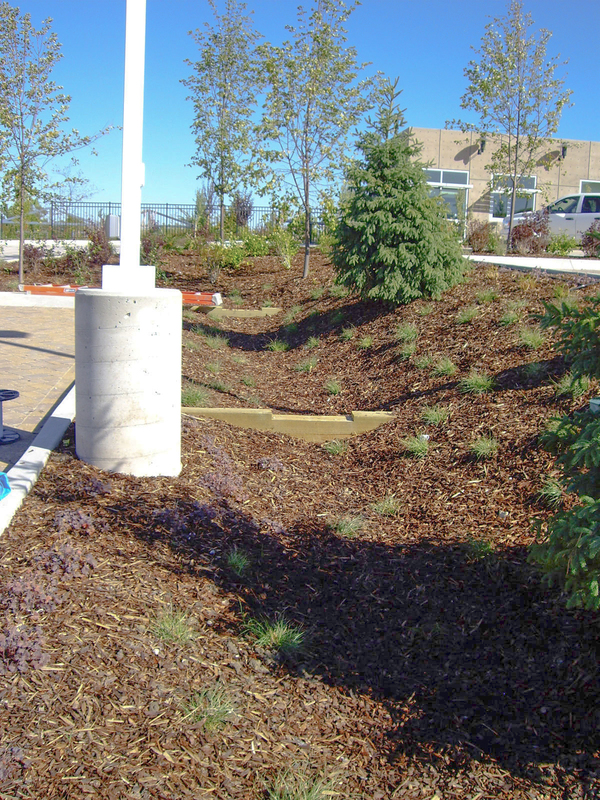 Bioretention systems also reduce storm water runoff volume by infiltrating and storing runoff water. Typically, bioretention systems are vegetated along the bottom and sides of the channel, with side vegetation at a height greater than the maximum storm water volume. They are designed as flow-through devices. Bioretention cells or rain gardens are small-scale, shallow vegetated depressions that store and filter storm water or runoff from roof downspouts or other impervious surfaces. Cells or rain gardens include compost-amended native soils or special soil mixes that can be planted with native trees, shrubs, plants and groundcovers. They usually have a simple inflow where storm water enters the cell or garden, and an above-ground overflow where excess water exits. The gardens can be used in residential settings as well as at commercials sites. 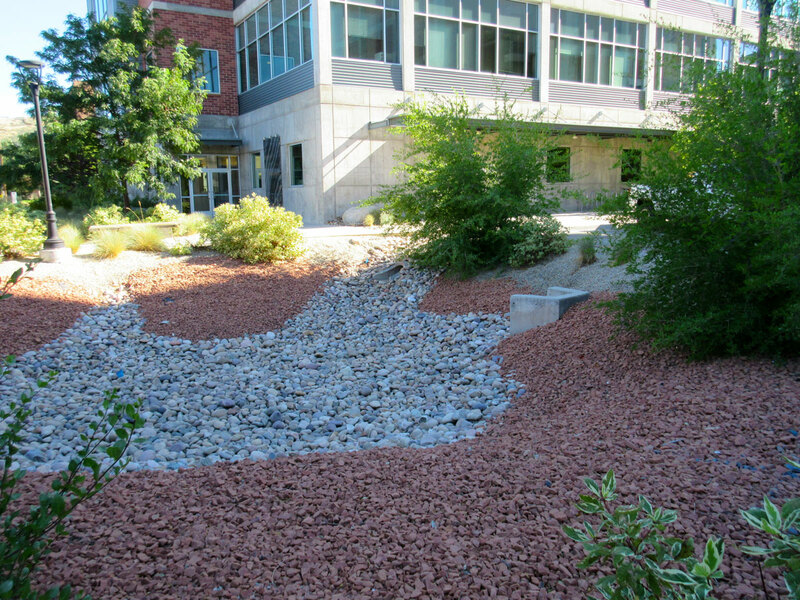 Photo: Bioretention rain garden located on the north side of North Salt Lake City building. Tree box filters are boxes, either elevated or below grade at the curb line, that are filled with a soil mixture in addition to plants or trees that are used to infiltrate storm water. Roof downspouts may be directed to tree box filters as well. Tree box filters are located upstream of a standard curb inlet. 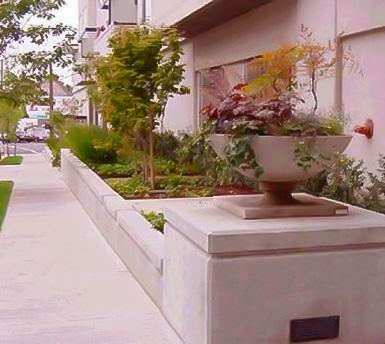 For low to moderate flows, storm water enters through the tree box’s inlet, filters through the soil, and exits through an underdrain into the storm drain. 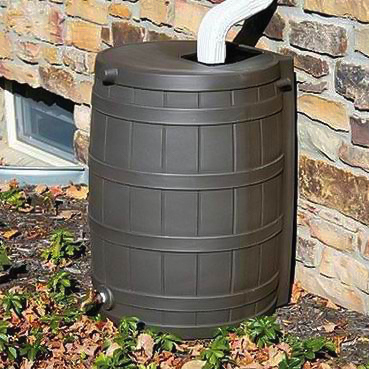 For high flows, storm water will bypass the tree box filter if it is full and flow directly to the downstream curb inlet. Green roofs help to mitigate the effects of urbanization on water quality by filtering, absorbing or detaining rainfall. They are constructed of a lightweight soil media including a drainage layer and impermeable membrane that protects the building structure. A special mix of plants are used that can thrive in the harsh, dry, high temperature conditions of the roof and tolerate short, intense periods of rainfall. 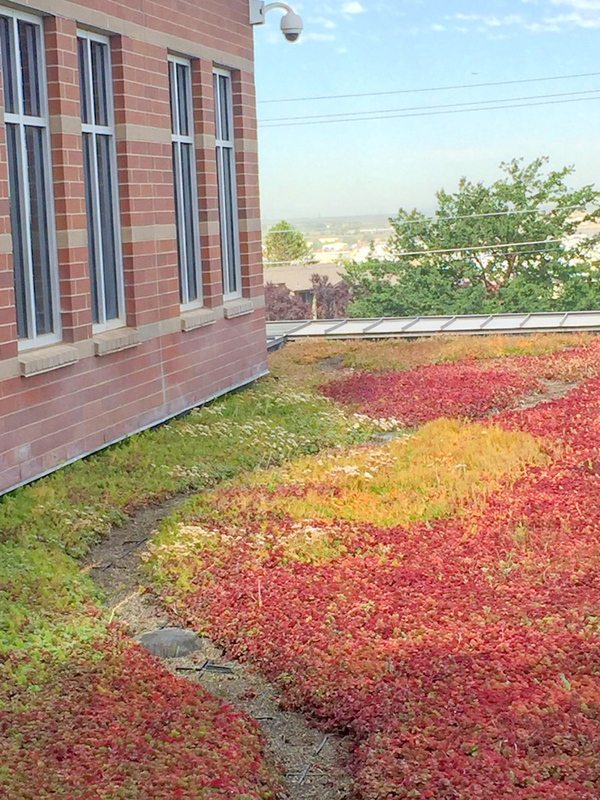 Photo: Green roof located at the entrance to the North Salt Lake City building. An open-graded asphalt or concrete with reduced fines and a special binder that allows for the rapid flow of water. 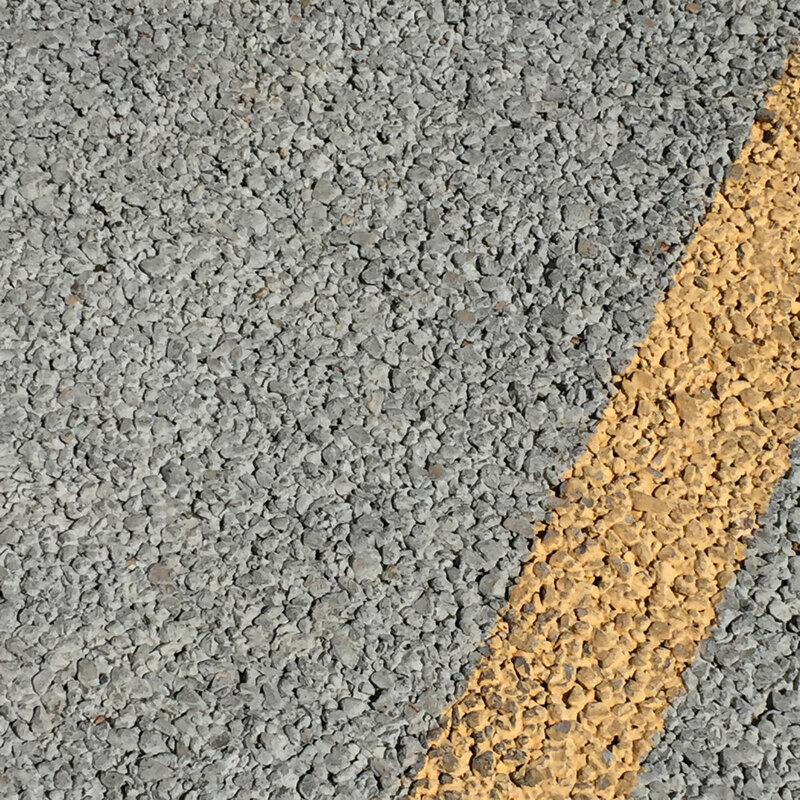 Water is able to pass through the pavement by flowing through voids between the aggregate. 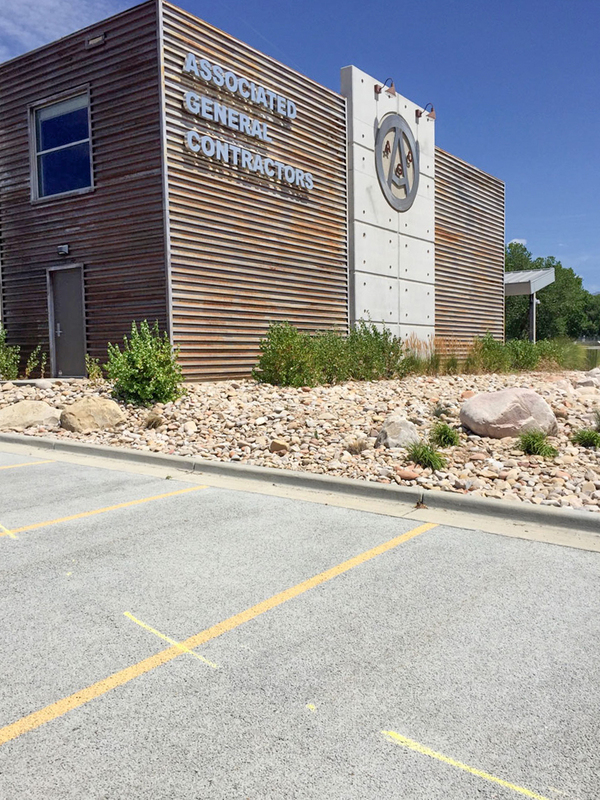 Photo: Pervious concrete located at the Associated General Contractors’ parking lot. 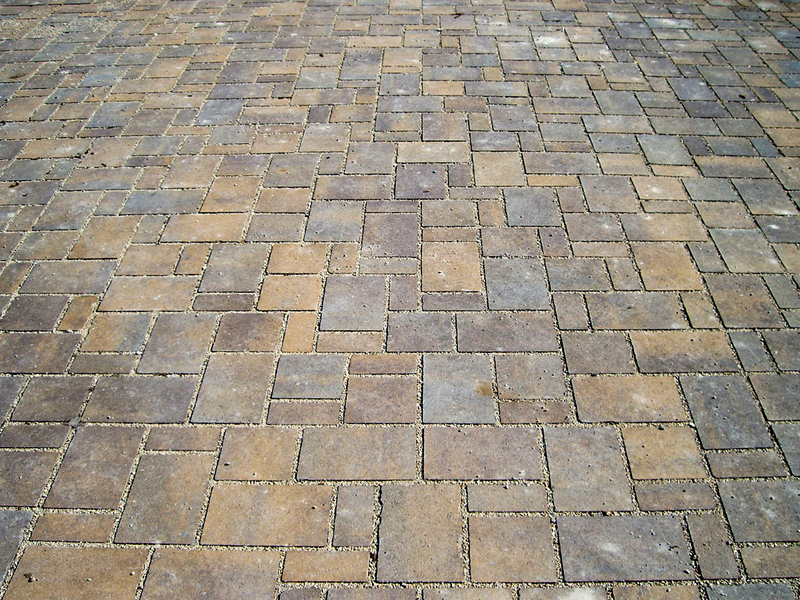 Paver blocks themselves are not permeable but are installed with gaps between the pavers to allow storm water to penetrate into the subsurface. The gap is integrated into the interlocking design of the paver blocks. Grid systems made of plastic grids filled with soil or aggregate are also used. Photo: Pavers at the Jordan Valley Water Conservancy District’s Conservation Garden Park. Minimize ground disturbance by identifying the smallest possible land area that is cleared, graded, and paved. Other examples of ways to reduce the amount of impervious surface on a site include narrow streets, shared driveways, and shared parking. Streets, roads, driveways, and sidewalks can be narrowed within the local zoning regulations. A cluster development places homes closer together on smaller lots. Typically, the remaining 40% to 50% of the land in the development remains undeveloped, resulting in less ground disturbance. 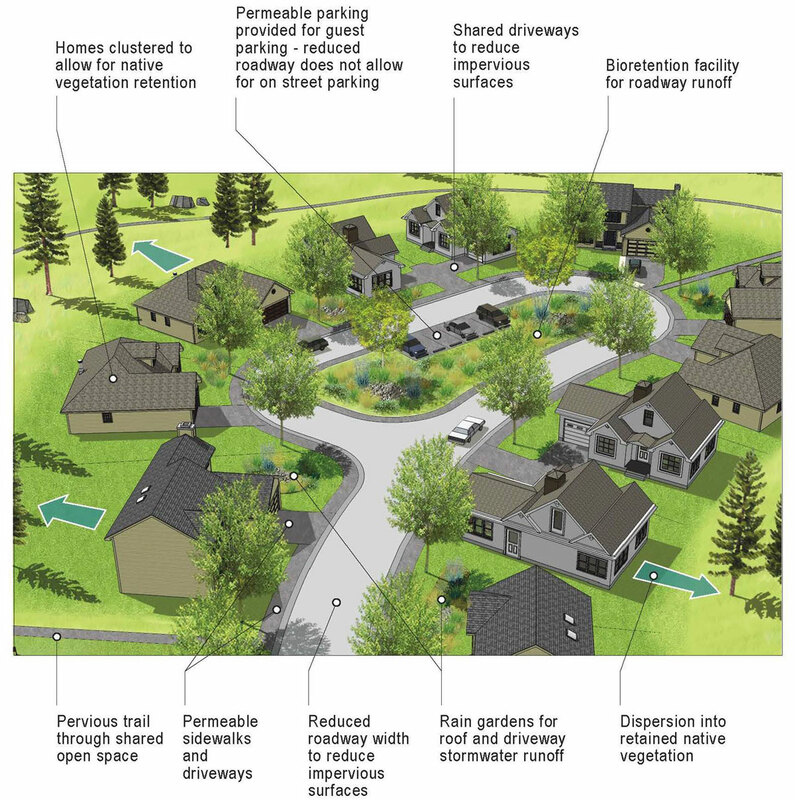 Runoff is redirected from roof leaders, roadways and other impervious areas onto pervious surfaces such as vegetated areas, reducing the amount of directly connected impervious areas and reducing the runoff volume and filtering out pollutants. 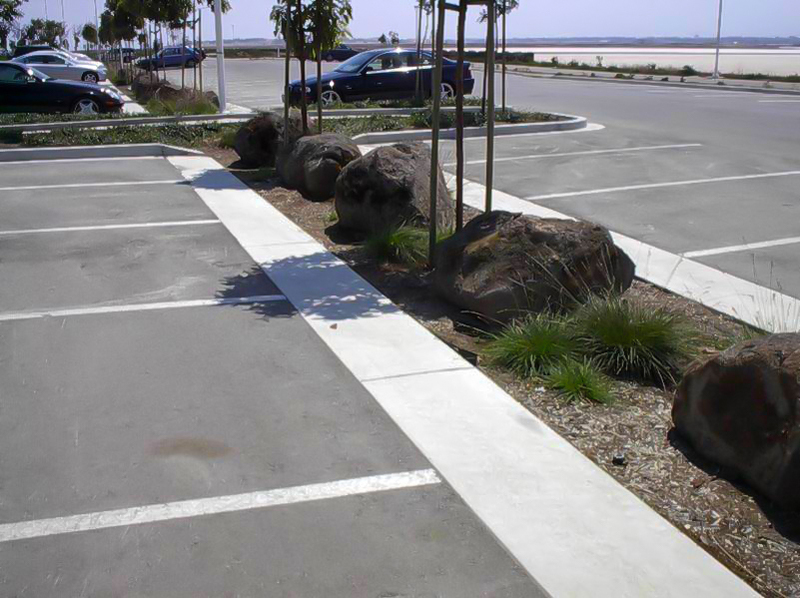 Openings created in the curb to allow storm water from the street (or any adjacent impervious surface, like a parking lot) to flow into a depressed infiltration and planting area. 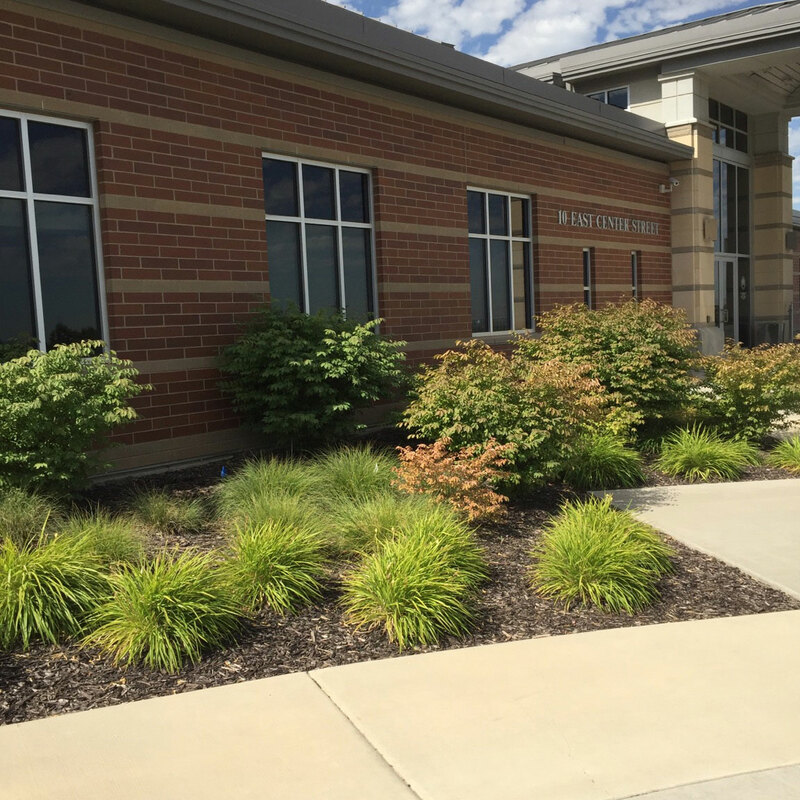 Bioretention–A bioretention area or rain garden is a shallow planted depression designed to retain or detain stormwater before it is infiltrated or discharged downstream. Evapotranspiration–Evapotranspiration (ET) is the sum of evaporation and plant transpiration from the Earth’s land and ocean surface to the atmosphere. Evaporation accounts for the movement of water to the air from sources such as the soil, canopy interception, and waterbodies. 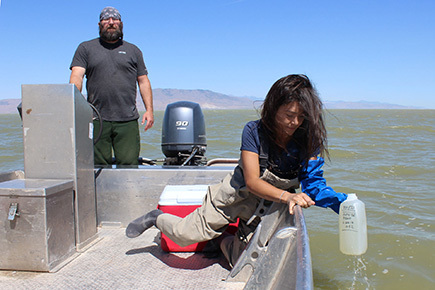 Hydrology–Hydrology is the science that includes the occurrence, distribution, movement and properties of the waters of the earth and their relationship with the environment within each phase of the water cycle.